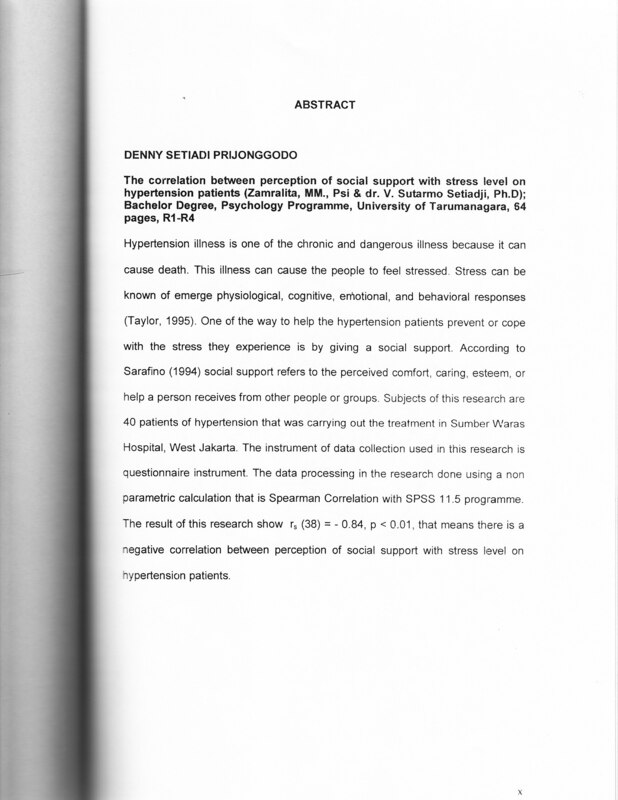 Setiadi, Denny (2005) Hubungan Antara Persepsi Terhadap Dukungan Sosial Dengan Tingkat Stress Pada Penderita Hipertensi. Skripsi thesis, Universitas Tarumanagara. Hypertension illness is one of the chronic and dangerous illness because it can cause death. This illness can cause the people to feel stressed . Stress can be known of emerge physiological, cognitive, emotional, and behavioral responses (Taylor , 1995). One of the way to help the hypertension patients prevent or cope with the stress they experience is by giving a social support. According to Sarafino (1994) social support refers to the perceived comfort, caring, esteem, or help a person receives from other people or groups. Subjects of this research are 40 patients of hypertension that was carrying out the treatment in Sumber Waras Hospital, West,Jakarta. The instrument of data collection used in this research is questionnaire instrument. The data processing in the research done using a non parametric calculation that is Spearman Correlatio n with SPSS 11.5 programme. The result of this research show rs (38) = - 0.84, p < 0.01, that means there is a negative correlation between perception of social support with stress level on hypertension patients.